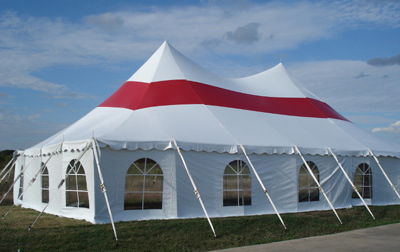 Don't let a damaged or worn out canopy stop your next social gathering; the 60 x 180 Mystique High Peak Tension Tent Top has got you covered, and the replacement is just as strong and durable as the original. Made from heavy-duty "Block Out" vinyl and reinforced with 2-inch seatbelt webbing, the canopy also boasts 2-inch seatbelt ratchet straps for secure fastening and triple reinforced stress points. The twin center poles and custom high peak engineering make this a fun but weather-resistant tent top.